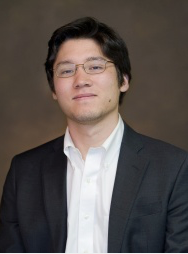 The overall goal of this project is to provide a detailed understanding of the human humoral response to Bunyaviruses, including Rift Valley Fever Virus (RVFV), Crimean Congo Hemorrhagic Fever Virus (CCHFV), and Hantavirus infection and to define the molecular and structural basis for inhibition by human antibodies. The Bunyavirus family is a diverse –ssRNA based family that can infect, cause disease and fatality in humans and animals. Specifically, RVFV and CCHFV have been listed as priority pathogens by the WHO and CDC. There are currently no approved vaccines, therapeutics, or prophylactics available to prevent or treat RVFV, CCHFV, or Hantavirus infection. Although work has been done on an experimental vaccine (MP-12) for RVFV, it has yet to be approved for general human use. Little is known about the human antibody response and how it correlates with protection. To address this gap in knowledge, I aim to identify protective antibodies to pathogenic members of the Bunyavirus family and to understand mechanistically how they protect against infection. I am using hybridoma technology supplemented with unique screening methods to isolate a comprehensive panel of monoclonal antibodies in order to study these viruses. Using a panel of antibodies directed to RVFV, we will study the cross-reactive potential, Fc-function, protective epitopes, and synergistic potential of these antibodies. Furthermore, we will understand mechanistically and structurally how antibodies protect and neutralize RVFV. Previously mentioned that Hantavirus will be the primary target. The primary target as of now is RVFV, which is becoming central to the overall thesis goal. Overall, we hypothesize that human monoclonal antibodies (mAbs) specific to RVFV glycoproteins, Gc and Gn, can be isolated from naturally infected and vaccinated patients that have the capacity to protect by neutralization and/or Fc-function. Furthermore, we hypothesize that these antibodies may be able to cross- react with other pathogenic members of the Bunyavirus family given the range of sequence conservation between members. Before beginning the campaign to isolate antibodies directed against RVFV. We developed two assays that could detect with confidence antibodies against RVFV glycoproteins. First, we transfected the full-length glycoprotein encoding M-segment of the RVFV genome into 293F cells. Using a flow cytometric detection system, we verified the presence of Gn and Gc in the cells using mouse monoclonal antibodies provided by BEI resources for both RVFV and CCHFV (Fig. 1). Using this system, we pursue antibodies using a high throughput IQue flow cytometer. We also adapted a neutralization assay against RVFV MP-12 on vero cells for high-throughput capabilities based on foci formation upon infection. We show the varying hit frequency at the LCL stage of the hybridoma process that different donors have using either EBV transformation 3T3 expansion methods with 10 million PBMCs being transformed each event (Fig. 2). Our lab obtained PBMCs from USAMRIID Special Immunization Program from multiple donors that have been vaccinated with Rift Valley Fever Virus attenuated vaccine strain, MP-12. Thus far, we have transformed 50 million cells from two different vaccinees. 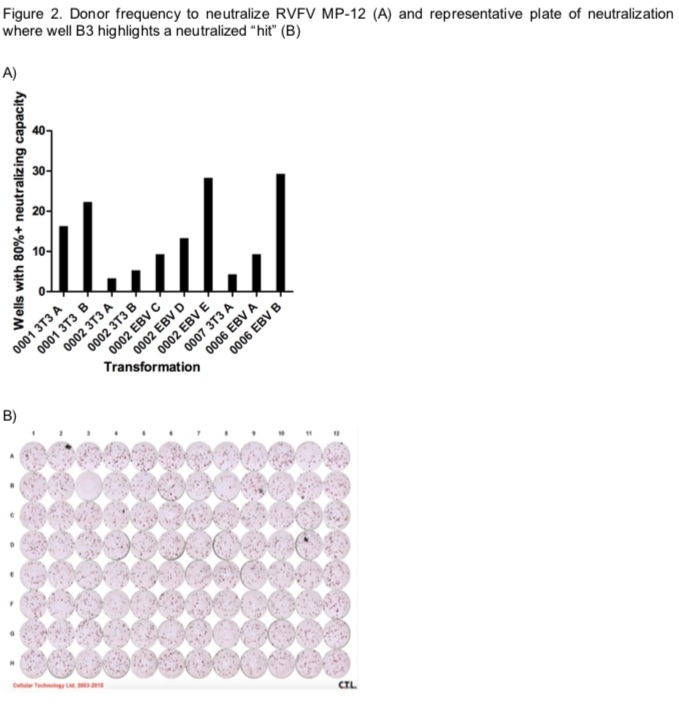 From these donors, we have seen 79 neutralizing hits off of an optimized neutralization assay using the MP-12 vaccine strain as the infectious virus on both BHK-21 (stably expressing DC-SIGN) and Vero cell lines from the four most recent transformation events. So far, we have recovered 14 mAbs from these hits into clones that are secreting mAbs, while many more are in the pipeline. Also, we have also screened by binding and have recovered 9 mAbs. We predict that 14 out of 23 clones thus far isolated have neutralizing capacity, but this number is yet to be fully verified using a titrated antibody stock. Overall, we are currently pursuing 56 distinct types of antibodies with three more transformations underway. We anticipate that there will be at least 70 antibodies directed against RVFV at the end of the samples that are currently being processed, with a little less than half of them producing antibodies that can neutralize RVFV MP-12. 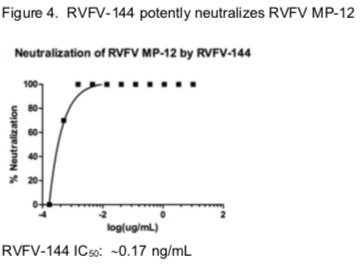 Recently, RVFV-144, the first isolated neutralizing mAb has been tested on a Vero monolayer using RVFV MP-12 vaccine strain. Preliminary results from the neutralization dilution curve after the first pass in triplicate indicate that the final IC50 value is 0.17 ng/mL. Despite the results being ambiguous due to the inability to fully recover full infection given the plate ran out of space for more dilutions, we believe that the IC50 value may be better (Fig 4). This result gives us confidence that we are detected and isolating functional antibodies against Gc/Gn on RVFV. We will continue to isolate more mAbs to RVFV MP-12. We hope to continue to isolate more potently neutralizing mAbs and to show protection in a mouse model and describe mechanistic aspects of RVFV using our isolated mAbs.